This free, one-hour webinar, presented by Gold Sponsor AccessData, will answer your questions about early data assessment & processing, with a focus on EDRM as a continual, iterative activity. 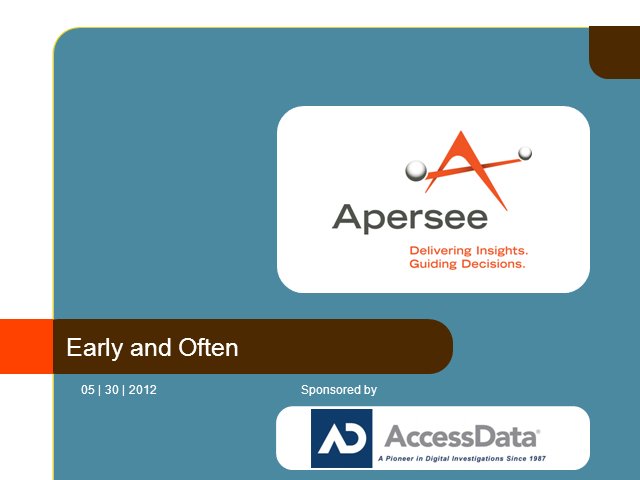 Led by Apersee founders George Socha & Tom Gelbmann, “Early and Often” is sure to be an information-packed session. The webinar was presented on May 30, 2012, from 1:00 to 2:00 pm Central.